They asked Hillel the Elder "Where are you going?" Replie he: "I am going to perform a sacred deed." Asked they: "And what is this sacred deed of Hillel?" Said he: "I am going to the House of the Chair". Asked they: "But is that a sacred deed to do?" Said he "Yes indeed, for by so doing one prevents the body from detoriating". Another time... about going to the bathhouse... "For by doing so one cleanses the body. Know that the statues of Caesar that are erected in the arena's are but facsimiles of the Image of God, yet the Romans wash them daily. If that which is but a facsimile of the divine image is deserving of such honors, so much more so is the body, which was actually created in the Image of God." According to R. Yehuda Brochos 21A (http://e-daf.com/index.asp), there is a distinction between halachos and "derech eretz". The latter can be learned b'tumah. While halachically one can draw various disntinctions, we do see that there is a difference between "derech eretz", whatever that may be, and other areas of Torah. Can it be a coincidence that anytime i struggle with something in yiddishkite you either write a blog about it or have a guest post linked? My Neshama is grateful. Just to clarify, I can think about G-d's oneness greatness and my love for him as long as I dont think of his sacred torah? Long Beach Chassid: Thanks for the feedback :) By the way, there is no such thing as a "coincidence". Thanks for bringing down those ma'asim. It just shows what we always learn in Chassidus, that everything in the world should be done in a way of avodas Hashem. I would hope that you can clarify your point more. What is "derech eretz" in this context that is permissible to study in the bathroom, whereas Torah is obviously forbidden? Does that mean something like "secular studies"? Thanks for your kind comment. I guess it's hashgacha that you see what you need to see, when you need to see it! Baruch Hashem! As I understand it, yes. 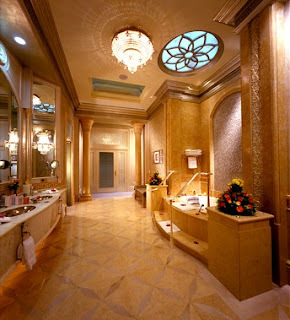 It is forbidden to think of Torah or sing Jewish songs like psukim in the bathroom. But you may, according to Rav Weinfeld, think of Hashem's existance. Thanks again for thinking enough of ignorant 'ol me to write something on your blog that I was able to learn from a sefer! There is a big machlokes about this issue and one should definitely ask a posek! The earliest source that I know of who permits is Rav Shlomo Kluger. There are a few others as well. However, it seems clear that the vast majority of poskim Rishonim and Achronim prohibit this. The Tzitz Eliezer (XIII, 1) and other poskim learn this from the fact that many poskim discuss what one can think about in the bathroom and thinking about Hashem doesn't come up. The Sefer Chasidim says that one should think about various cheshbonos and on Shabbos when this is forbidden one should think about beautiful pictures and buildings. This Sefer Chassidim is quoted in the Magen Avraham (the first half the Machsis Hashekel there quotes the rest) and Shulchan Aruch Harav 85 #1 as well as the Kitzur Shulchan Aruch. Why don't all the poskim discussing this say this wonderful idea of thinking of Hashem? There are other proofs but the comments here is not the is not the forum. The Noam Elimelech in Ki Tisa D"h Mishoch, "One should also be modest in the Beis hakisay and should only think of permitted things there. D'haynu: that he is filled with embarrassment and shame..."
Thank you for the very specific mekoros on this. IY"H, I'll ask my rebbe about these opinions. Thank you very much! I learned that we don't say brachot or learn Torah in the bathroom because it is a place where klippot are expelled and therefore attracts these forces in kind. Any source of kedusha allows them to feed and be strengthened. I seem to remember that this was one of the issues about which the original Misnagdim attacked the Chassidim, who stressed the concept of Hashem's ominipresence ("ein ode milvado" / memale kol almin). Yet there is a well-known tradition that the Baal Shem Tov once came back from the bathroom and announced, "I just fulfilled the entire Torah -- by performing the mitzvah of not thinking about what we are not allowed to contemplate in the bathroom!" Sometimes not-doing or not-thinking is just as great as doing or thinking! I see everyone addressed the bathroom question but ASJ also asked about a brothel and a place of idolatry as well. i've often accused ASJ of secretly being in touch with what's going on in other people's lives..
i always think about this issue a lot as well, since my mind wanders a lot..
Devash - this is exactly the point raised by Kav HaYashar (11). Akiva, I recently learned at the end of the first perek of Tanya in Rav Shteinzaltz's Peirush that there is Divine light not only in Klipas Noga, but also in the Shalosh Klipos Hatemeios. The difference is, he said, that the Nitzotz Kedusha can be extracted and separated from Klipas Noga, but it, practically speaking, can never be extracted from the Klipas Noga, at least by us. Perhaps that could be applied here as well, to say that while Hashem is "in" places of Tuma equally, it is something that we will never be able to access in Olam Hazeh. When Moshe encountered Pharoh relieving himself at the bank of the Nile he mentioned Hashem's command to let his people go - thus speaking words of kedusha in the presence of urine. Dixie Yid, how do you explain this?? First of all, my name isn't "Dixie Yid." It's "Yeps on the Steps." Also, this was a case of Pikuach Nefesh, saving the Jewish people. So the pirincipal of pikuach nefesh docheh es hakol would apply. Also, telling someone a halacha pesuka, that Hashem says he must let the Jews out of mitzrayim, may not be asur to think about in a bathroom anyway. You have to know how to behave in a bathroom halachicly after all and you can't know what to do if you don't first think about what you must do. That's different from "thinking in learning." Also, it may not have a din of beis hakisei anyway since it was a river, where any feces are immeidetly washed down-river. What IS klipahs noga?? My name is noga! !